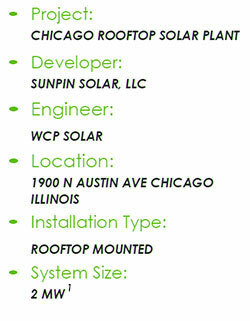 WCP Solar was contracted by SunPin Solar, LLC, a solar developer in the state of Illinois, to design and build a rooftop mounted solar system on the roof of a building located at 1900 N Austin Avenue in the city of Chicago IL. This grid connected system ties directly into the customer’s property and also feeds the power grid and generates enough electricity to provide power to more than 400 homes annually. Knowledge, experience and a highly trained staff of industry professionals allows WCP Solar to excel in managing this selective project and assures the client an on time, on budget solution to their construction needs. As with many rooftop sites; the roof is flat. The system design employed a 10 degree inclination of the more than 8,000 solar panels used in the installation. This solar plant is the largest solar rooftop mounted system in the Midwest and is the third largest rooftop system installed within the USA. This system was commissioned on October 19, 2013 and is expected to supply all the energy needs of the property and the excess energy sold to the grid using the interconnection agreement with the local utility company. Completed on October 19th, this project was another example of strong design management and project leadership by the WCP Solar team. 1 Estimated reduction of over 28,600 tons of CO2- Equivalent to planting over 1,369,830 trees or displacing CO2 from emissions from the electric use of over 6,650 homes.